The workshop will take place in historic observatoire de Paris, in the prestigious " Cassini Hall". Observatoire de Paris, Batiment Perraut, first floor, Cassini hall. Entry via the Observatoire de Paris, 77 Avenue Denfert Rochereau. This superb XVII century room is crossed by the Paris Meridian. 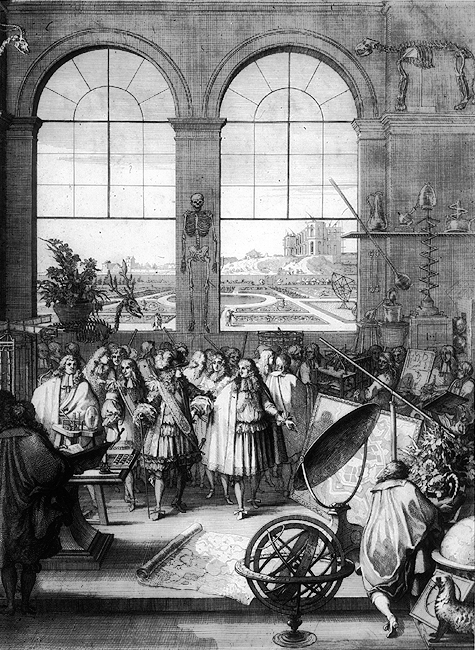 In 1671 the king Louis XIV was visiting the Academy of Science. Through the windows you can see the Observatoire de Paris being built. Cassini Hall has been in existence for a long time... On this XVIII century etching, you can see the Observatoire de Paris. Cassini Hall is on the first floor, the three central windows. The batiment Perault of the Observatoire de Paris today. Cassini hall during an art exhibit. 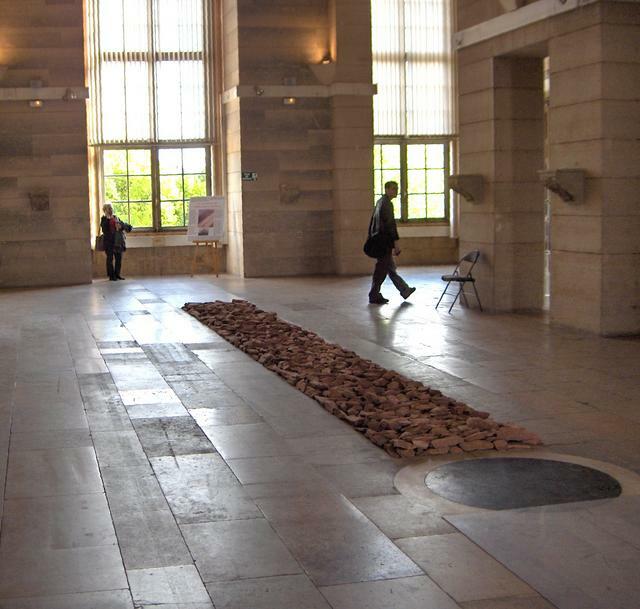 The meridian of Paris in the midde of the hall. crédit obs. Paris for the images of this page. It is the oldest observatory still in service. In 1665 the physicist and astronomer Auzout convinced Colbert and Louis XIV to construct `l'Observatoire Royale'. It is built without wood (to avoid fire) or metal (to avoid magnetic disturbances). At the summer solstice of 1667, the orientation (north-south) is traced in its place by members of the Académie Royale. Claude Perrault (the architect of the Louvre Colonnade) projected the building and directed its construction. It was finished in 1672. It is a large rectangle (31 m x 29 m) with its four faces oriented with the cardinal points of the compass. The latitude of the south face defines the Paris latitude (48° 50' 11''). The meridian line passing through its center defines the Paris longitude. The foundations are as deep (27 m) as high is the building itself. The Observatoire is in charge of the French legal time: UTC(OP) and of the Central Bureau of the International Earth Rotation Service. In 1933, the first speaking clock in the world started to give the accurate time by telephone (tel. 3699) from the ground floor of the Observatoire. The basement of the Observatoire is connected with the Paris catacombs (visits forbidden). The catacombs consist of 65 km of underground galleries. First, at the head of the Observatoire de Paris was Jean-Dominique Cassini (Cassini I), born in Italy in 1625. He was followed by his son Jacques (Cassini II), his grand-son César-François and his grand-grand-son Jean-Dominique. The Observatoire was later leaded by Joseph Jerôme Lefrançois de Lalande, Pierre-André Méchain, François Arago (1843-1853), Urbain Le Verrier (1854-1870 and 1873-77) and other distinguished personalities. Further illustrious scientists worked at the Observatoire like Jean-Baptiste Delambre, Charles Marie de La Condamine and Pierre Simon de Laplace. - The map of the Moon by Cassini I that was the best till the photography was invented. - The discovery of the gap in the Saturne ring by Cassini I and the table of the satellites of Jupiter movements that allowed the danish astronomer Olaüs Römer to show that the speed of light was finite and compute approximately, for the first time in 1676 while he was working at the Observatoire. - Jacques Cassini discovered the proper motion of Arcturus, showing the first that the stars were not fixed. - César-François and Jean-Dominique (IV) Cassini made the first modern map of France from 1750 to 1790. - The units of mass (gramme) and length (meter) were defined following measurements (along the France meridian) and researches made at the Observatoire. Lavoisier worked here on the mass unit. - Arago introduced here the photography in astronomy. In 1845 Hyppolite Fizeau and Léon Foucault obtained the first daguerreotype of the sun. - Foucault in 1850-51 showed manifestly the rotation of the earth with his pendulum hanging in the salle Cassini (after a first experiment at his home, and before the demonstration at the Panthéon). - The works by Le Verrier lead to the discovery of Neptune. His tables of sun and planets positions were used for more than one century. Discrepancies remarked by him between the calculated and observed orbit of Mercury were only solved with the advent of general relativity.